The other day my neighbor headed to a United Airlines affiliated site in Chrome to book a trip and was greeted with “Server has a weak ephemeral Diffie-Hellman public key.” Full stop. She could not continue on to the site. This is occurring because there is an attack in the wild that takes advantage of a flaw in the Transport Layer Security protocol (a fancy way of saying the supposedly secure way in which a web server communicates to your browser) in order to watch your traffic. This is called a Man in The Middle Attack. Essentially it inserts itself between you and your destination and logs your conversation. You can read more about this here. The solution is, unfortunately, out of your hands. Your browser isn’t broken – The site you’re trying to get to is. And, as evidenced by it affecting a United Airlines site, there are some heavy hitters who are vulnerable. Any site that’s running 1024 bit or less encryption needs to upgrade to 2048 to close the hole. By default these are set to True. Change them to False and you’ll be able to hit the effected site. I STRONGLY recommend only doing this on a site you absolutely trust, and only in situations where there’s absolutely no other recourse, and I recommend changing these back to True as soon as you’re done on that site. 0 Day Java Exploit. How to disable Java in your browser. In Firefox : Press Firefox button -> Add-ons, go to Plugins and click the “Disable” button next to anything named “Java”. In Chrome : Type in: “chrome://plugins/” into the address bar (no quotes). Scroll down to Java and click disable. Java(TM) Platform <click on> Disable. Java Deployment Toolkit <click on> Disable. Disable UAC (if enabled) and restart. 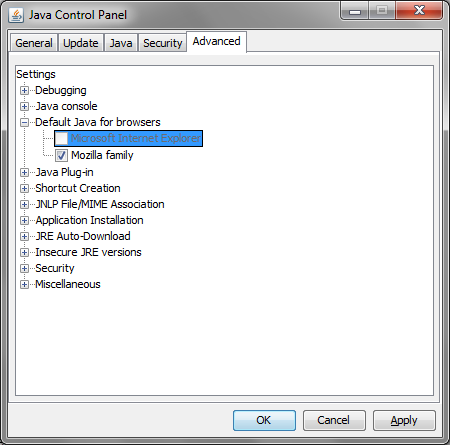 Open the Java app in Control Panel. The checkbox next to IE is grayed out. Select Microsoft Internet Explorer and press spacebar. Click OK.
You can re-enable UAC and restart now. Facebook’s apparently watching wherever you go, whether you’re logged in or not. Lifehacker talks solutions. Fast forward a bit. XMarks announces it’s going under. Sadness ensues. Switch to FireFox sync. Fast forward a bit more. FireFox begins releasing its beta builds of FF4. Sync is built in. 4 seems delicious – and then I tried to manage my bookmarks. Slow. Painfully, mind numbingly slow. Inoperable, in fact. It seems that FF4 uses SQLite for its bookmark containment, and everything went into the shitter as of SQLite 3.7.x. Meanwhile LastPass purchased XMarks (probably for a song, having waited until the 11th hour to do so) and Chrome has since opened up, finally supporting 3rd party plug ins. Time to try again! Xmarks: Hey! I found a bookmark! I’ll sync it and slip a date string in it! GSyng: Hey! I found a bookmark with a funny date string in it! It must be new – I’ll sync it and put my own bit of something in it! Xmarks: Hey! I found a bookmark that’s startlingly similar to the one I just synced, but it has a new little bit of something! It must be different – I’ll add it and update its date. GSync: Holy cow! There’s a familiar looking bookmark – but that funny date string is different. I should totally add that! …and so on and so forth. Long story short, only use one bookmark sync method lest you wind up like me, writing a script to identify and strip duplicates from your 5000 item large bookmarks list.